Cardiologist Dr. Rolf Gomes founded Heart of Australia with the vision of bringing specialist cardiology services that people in the city take for granted to the people living in rural and remote Queensland. Heart of Australia is an Australian first, a custom-made mobile medical clinic which is fully equipped with specialist diagnostic equipment. Dr. Gomes is also principal of Medihearts, a private cardiology practice in Brisbane. With the aid of like-minded organisations and colleagues, Heart of Australia was launched in October 2014. Dr. Gomes was included in Queensland’s 50 Best & Brightest in 2014. I am a general cardiologist with an interest in optimising the delivery of cardiovascular medicine to at-need populations in challenging environments. I believe in order to maximise the benefits from medicine we need to not only develop cutting-edge treatments but also find ways to deliver these treatments to the masses. In Australia there are significant challenges in providing basic cardiovascular services to populations living in remote and rural areas. Being a large continent with a dispersed population there are geographical challenges in getting services to these people. In my particular state (Queensland) 30% of the population live in outer urban regions where access to basic cardiac services like exercise stress testing is unavailable. As a result these populations suffer worse cardiovascular outcomes. In fact research shows that if you live out of the city you have a 44% greater chance of dying of cardiovascular disease. Australia also has one of the higher rates of rheumatic heart disease affecting our indigenous people mostly living in rural and remote locations. Communicate the vision and direction of your organisation clearly with your staff so that they feel a part of the journey not just a small cog in a big machine. Launching the Heart of Australia mobile clinic on the 4 October 2014. That was the culmination of a 5 year journey to transform a vision into a reality. Engineer. In fact my first degree was in Electrical Engineering. I worked 2 years as an electrical engineer prior to switching to study medicine. I believe there is a large part of my engineering background embedded in this project. I believe the Heart of Australia programme combines the dictum of doctors to ‘prolong life and ease suffering’ with the mantra of engineers which is ‘to make things happen’. Finding time to think clearly. Family life (I have 3 children aged 7, 6 and 3). Playing the piano and guitar (I am not very good). Public speaking and personal self-development. “If it is to be, it is up to me”. 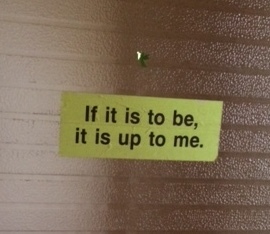 When I was growing up my mother placed a sticker on our backdoor with this quote (see photo), which we stared at every time we entered and left.